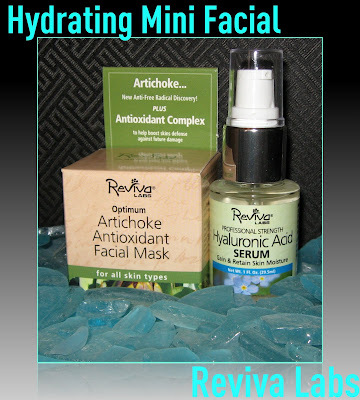 Reviva Labs Hydrating Mini Facial Review & Giveaway! I started using Reviva Labs skin care products almost a year ago, and they have since become my primary source for facial skin care. I still sample other products that are sent to me, and I choose the occasional skin care sample from Sephora, but as far as purchasing new skin care lines, I haven't felt the need to. Yes, I do receive products from Reviva to review, but I've also ordered from them because I was impressed enough with the results that I didn't want to run out! They have a vast range of products and I have spent quite a bit of time reading about many of them on their web site. They list all of the ingredients for each product, and there's quite a bit of information that answers my long list of never ending "But how and why?" questions. Their products are all natural, and they don't test on animals. You can find their products on their web site, at Whole Foods, and other natural health food stores. If I were to tell you the one thing that I like or notice the most after using any of Reviva's products, it's that--as corny as this sounds!--my skin has a noticeable glow to it. To me, healthy skin looks soft, even and glowy. I don't mind a wrinkle or two, they add character. But I want my skin to look as good as it possibly can, given my age, and this line seems to work very well for me. Plastic surgery or even injections are not something I ever see myself doing, because I'm scared to death of anything medical, particularly needles and scalpels! Reviva has graciously sent me an extra set of these products, so that one of my readers can enjoy a Mini-Facial of their own. If you'd like to enter, leave your eMail in the comments section below. Just for fun and because I'm curious (and no, you don't have to! ), tell me what your favorite skin care product is, or share your thoughts on if you'd ever resort to injections or plastic surgery. I'll accept entries until I post my Come Monday newsletter on December 20, and the winner will be announced then. *Products furnished by Reviva labs for review and giveaway. My 49 year old skin could use a lift. Right now I'm using a mixture of Lush Angels on your face (I think that's what it's called) and some Wonderbar. Neither are great for my skin, nor are they terrible. Best results I've had with a skin care line so far have been when using the Aveeno line: a mixture of Positively Radiant and Clear Complexion. These sound pretty good to me. I need all the help I can get. Right now I'm using Elizabeth Arden Ceramide Capsules. They were a gift with purchase. This time of year the product just gets sucked into my skin! Thanks for the giveaway Mary. O!!! exciting!!! my favorite skin care product has to be Olay Regenerist Micro-Sculpting Cream!! i can't live without it (i tried once- big mistake). i love it! I'm currently liking Silk Naturals Super Serum. Also, Kate Somerville's ExfoliKate make my skin feel so smooth because it's a very effective exfoliator. My favorite skin care item is a facial scrub. I love how those exfoliates and cleans at the same time. These products sound great! I like Paula's Choice Hydrating Treatment Cream the best. It's the nicest moisturiser I've found (in my budget). I would definitely consider Botox or Surgery when I'm older, providing of course that I can afford it. What I want to do most though is to get rid of the broken capillaries on my face. I haven't tried their artichoke mask yet. It's sounds fabulous! I will admit that my bathroom cabinet looks like a shrine to Reviva Labs. Their products are consistently well formulated. My fave natural product is JASON Beauty Oil. It's a great moisturizer and since it is a mix of five different oils, no chemical additives/stabilizers are needed. I've had spider veins lasered off in the past, but that would be the extent of my going 'under the knife'! And Yes, I'm agree with plastic surgery if you need. thanks for your giveaway! my fave skin product is lip balm (Sara Happ's The lip slip lip balm <3) It heals chapped lips under -30 degrees when I was in Sweden! Thanks for the great giveaway! My favourite skin care product is actually just my Pears soap! It keeps my skin feeling so clean! Also, personally, I would never opt for plastic surgery. I guess it looks kind of unnatural to me. I mean as you grow older yes you'll definately not keep on looking the same but I think the best thing is to embrace that change and go with the flow rather than try to keep on turning back the time and not accept a natural reality of life. My favorite product is the Neutrogena Oil-Free Acne Stress Control Power-Clear Scrub (man, that is a mouthful!). Personally, I wouldn't do plastic surgery. I won both of these in a recent giveaway and I use it weekly. The results are just as you said amazing!!!! After the first use my skin glowed and it looked sooooo smooth! My favorite skin product is whatever's cheapest, haha. Right now I'm using Neutrogena's grapefruit creme cleanser and I love the way it smells and the little bit of tingle I get on my skin when I use it. I don't think I would ever get an injection or plastic surgery. Avene termal spring water is my all time favourite facial product. My favourite skin product is Cetaphil moisturising lotion. My absolute favorite skin product is Shiseido spf 55 for face. Love it! i LOVE Murad products...great at taking care of acne! My main problem being that I still haven't found what will prevent those pimples from appearing on my chin on such a regular basis, I thought that this wasn't supposed to happen after 30, and I am 35! I'm a big fan of philosophy's hope in a tube...makes my under eye area moisturized all day! Mini facials at home could really be a great solution to maintaining the ageing skin.The pack sounds impressive.It is also a factor what skin texture it is going to be best for.